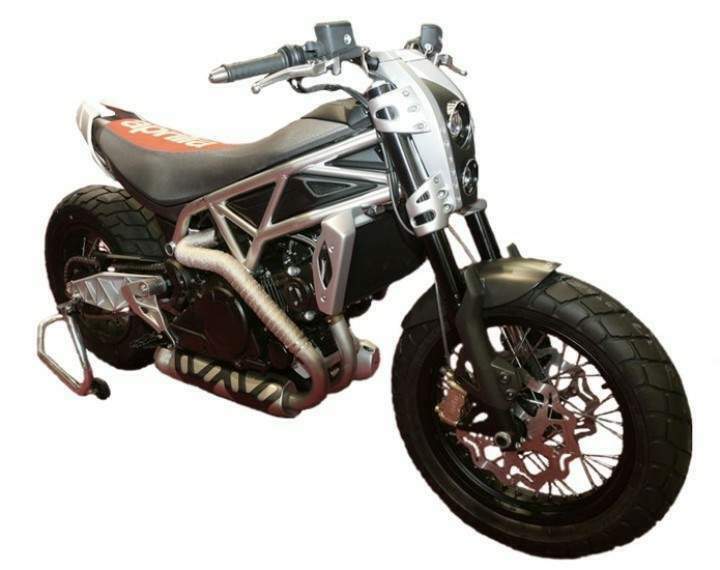 Aprilia Mana X concept. Based on the 850 Mana, it has a 90°, 850cc V-Twin mated to a super-sized CVT transmission. It keeps the Mana's trellis frame, but with a new internally braced swingarm. Wheels are laced jobs, with the rear getting the 180/70-16 Dunlop D427 designed for Harley's FXDF Fat Bob! Braking is handled by wave-style rotors and the Brembo-like, radial-mount calipers found on the Mana, Shiver and Dorsoduro. 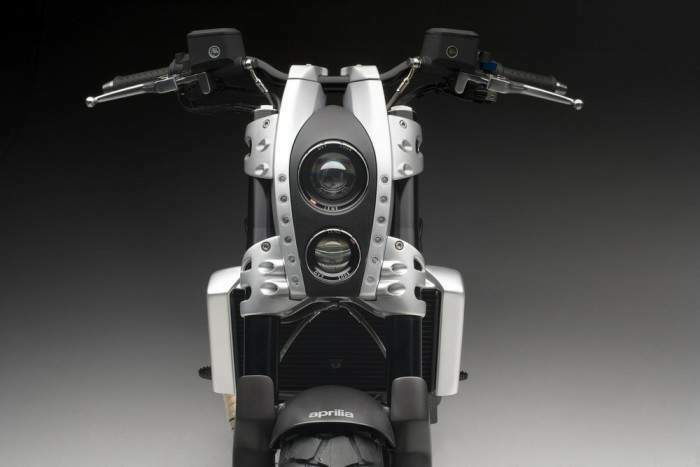 The rear shock and muffler are slung underneath, à la Buell. Styling is minimal and chic, with more than a passing nod to American street-trackers. 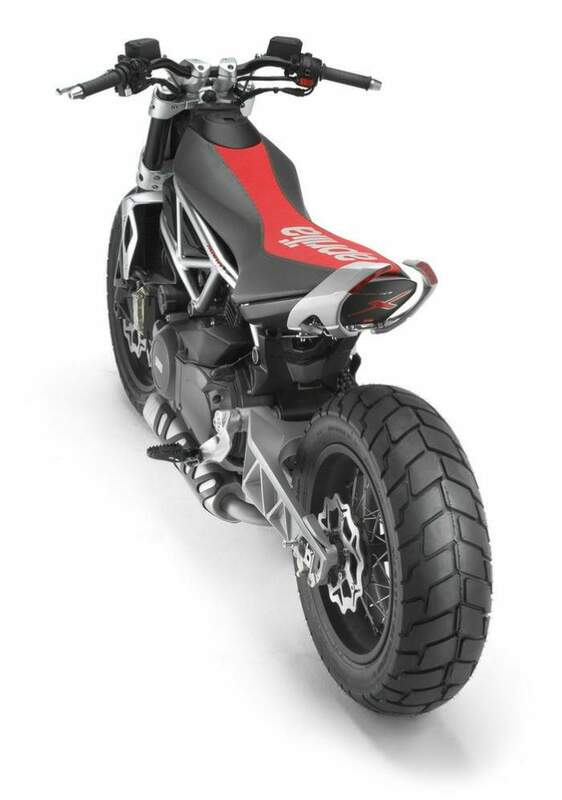 Such spare, aggressive styling is to be expected from Aprilia's design studio in Noale; it's headed up by Miguel Galluzzi, who designed the first Ducati Monster in 1992. "All you need," as the big, friendly Argentine is quoted on Ducati's history website, "is a saddle, tank, engine, two wheels, and handlebars." 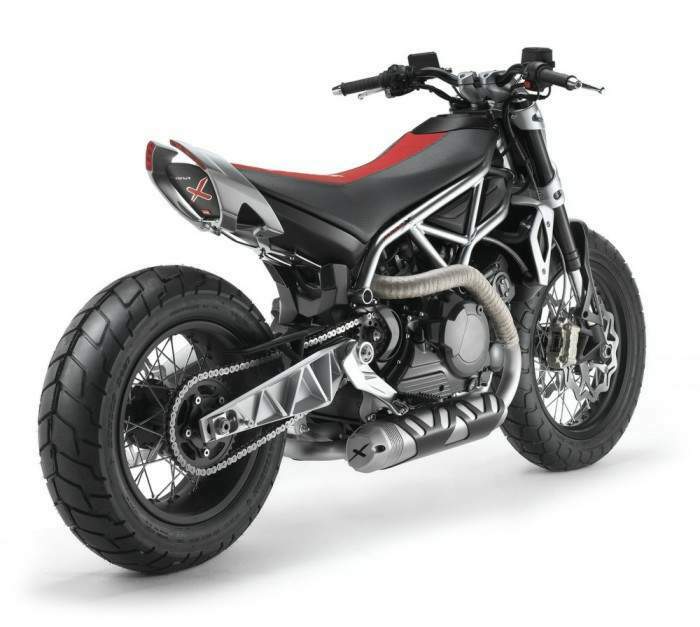 APRILIA MANA X APRILIA EXPLORES THE AUTOMATIC CONCEPT OF MOTION AND LANDS TO MANA X, SOPHISTICATED, YOUNG EVOLUTION AND TRASGRESSIVA OF REVOLUTIONARY NAKED 850. In the 2007 Aprilia an innovative and thus revolutionary plan has launch with Mana 850 to change the same habits of the motorcyclists. Aprilia Mana is not a simple motorcycle, but much motion in a revolutionary Sportgear change, managed electronically, is in a position to offering an only pleasure of guide. Thanks to the three mappings for the management Autodrive of the transmission, or using the sequenziale change to seven gears, Mana offers always to the just brilliance in every situation always obtaining the maximum yield from bicylindrical 850 cc. Aprilia Mana represents the maximum dell ? technological evolution applied to a motion and already available for all; a challenge that only the spirit of Aprilia, voted all innovation and technological evolution, is successful to face and to win. Now, with concept the Mana X, Aprilia the concept of " easy divertimento" widens that it is to the base of this revolutionary plan. Mana X extends and synthetizes, the only values of the Mana plan. Maintaining like bench marks bicylindrical diamond 850 cc to V of 90°, the revolutionary Sportgear change to management electronic and the chassis, Mana X represents not only one evolution rather but the declination than one of the multiple possibilities of expansion of the topic of the automatic motion. Mana X is one concept that it more delineates the advanced synthesis of the Aprilia knowledge and leaves to catch a glimpse of the wide horizon of potentiality of development and evolution that the Mana plan door in itself. Mana X confirmation name conquered from the naked version. Nothing raises of the clutch, all is managed electronically, leaving the single pilot the pleasure to guide. Concept Mana X estremizza i principles of versatilità, ease of handling and pleasure of guide, in a motion that, characterized from the revolutionary change sportgear, addresses absolutely young, dynamic a public of motorcyclists, naturally carried to reward originality and trasgressione. Mana X is one motion that escapes every predefined category, not comparabile to others of for style, of for performance, placing itself as objective last the maximum pleasure of the motorcyclist. The layout completely new, the totally unknown posterior suspension, the tires is of generous section, Mana X emphasizes indispensable, the necessary one, and represents nearly the negation of the design commonly meant. In this concept to an essential spirit in which every stilistica and progettuale choice has as objective the semplicità of approach and of I use.